Civil War | Historic Vienna Inc. 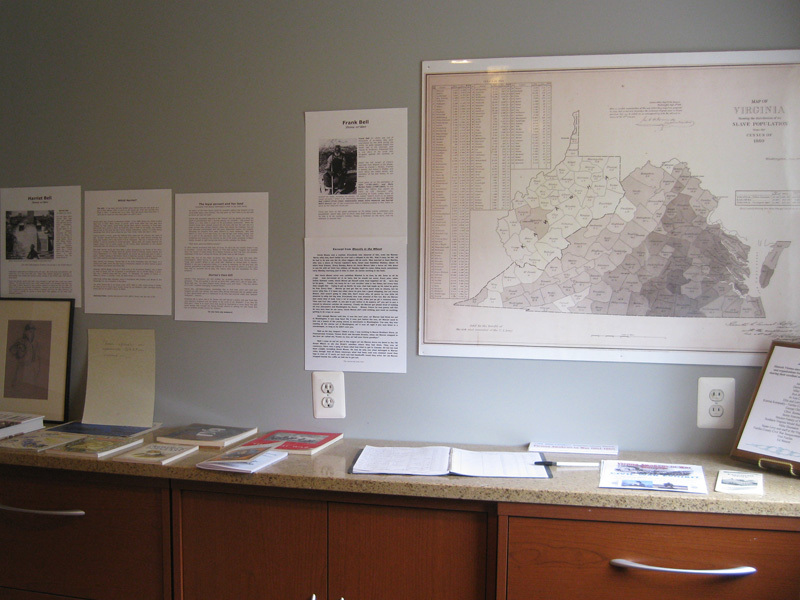 It was only ten years ago that Historic Vienna, Inc. opened our first exhibit. 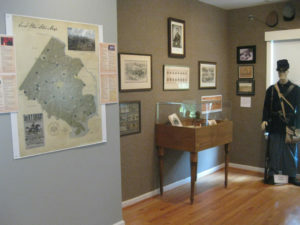 It was a small collection of framed photographs and woodblock prints and we called it “Civil War Scenes and the Freeman Family History.” In the years since, our volunteers have mounted eight more exhibits, with topics as varied as the Vienna Volunteer Fire Department, Vienna’s African American community, Jamestown’s 400th anniversary, World War II, the Civil War, Rails to Roads to Trails and the Country Store. 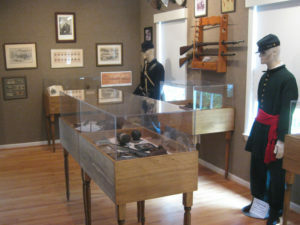 We have added hand crafted display cases and expanded to mini-exhibits on such things as the War of 1812 and Vienna Woods. As each successive exhibit opens, we are not only grateful to the many history-loving and community-minded citizens who have entrusted us with the loan of their possessions, but also to the HVI volunteers who have spent hundreds of hours researching not only the factual history behind each exhibit topic, but also educating themselves in display techniques, contacting potential donors and supporters, and actually mounting the exhibits. Our Guest Books tell the story – visitors are finding us and are looking to HVI as a source for interesting, educational and challenging exhibits, right in their own backyard! The Spring Membership Meeting of Historic Vienna, Inc. will be held on Thursday, March 28, at 7 PM at the Dyer-Gunnell American Legion Post 180 (330 Center Street North, Vienna). Following a brief business meeting and announcements, the Speaker for the evening will be local historian and reenactor Jon Vrana. The Social Hall entrance is on the second floor. Please drive around the building and park at the upper level. 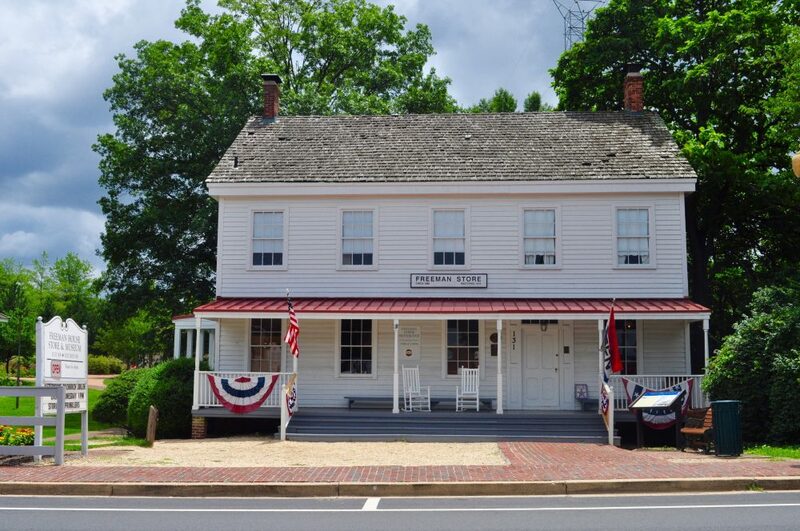 Mr. Vrana is currently President of the Burke Historical Society, Board Member of the Fairfax Station Railroad Museum, and has served on the Fairfax County Sesquicentennial Committee. He has vast experience as a living history civilian and military reenactor and has appeared as Senator Justin Morrill, Capt. Samuel Means, Henry Thomas Harrison and Col. Silas Burke. At the HVI Membership Meeting, Mr. Vrana will discuss the history of the Alexandria, Loudoun & Hampshire Railroad and others which ran through Vienna from 1855 to 1968. 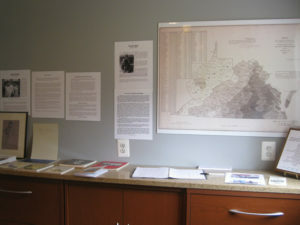 The exhibit “Roads to Rails to Trails” is currently open in the Freeman Store exhibit room and includes photographs, drawings, maps, artifacts, replicas and displays, illustrating the evolution through the years to what we now know as the W & OD Trail, a Northern Virginia Park Authority property enjoyed by 2 million visitors each year. If you have ever walked, jogged or biked on the W & OD or if you are a lover of trains, Mr. Vrana’s lecture and the exhibit will be of interest and we encourage you to attend. HVI’s Membership Meetings are free and open to the public. Refreshments will be served. Please call (703) 994-9054 for more information! Vienna Awakens to War 1861-1865 is open for visitors at the Freeman House (originally Lydecker’s store during the war) from 12:00-4:00 PM, Wednesday through Sunday. 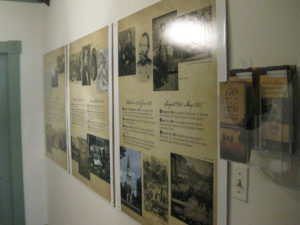 The exhibit has been extended through the end of 2012 due to its popularity. This exhibit takes a look at the War Between the States through artifacts loaned by members of the Vienna community, some of which have been passed down through many generations of family members and others lovingly collected by the current owners. 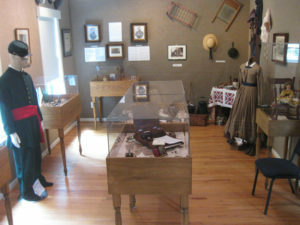 The exhibit, designed and mounted by Historic Vienna Inc. volunteers, includes reproductions of Union and Confederate uniforms and a dress of the period, bullets and ammunition, a genuine Colt revolver, buttons, currency, a Confederate war bond, original 1861 Harper’s Weekly pages on the Battle of Vienna and on the use of an observation balloon between Vienna and Falls Church, artifacts on camp life and domestic life such as children’s games and cooking utensils, a beautiful period doll, an officer’s writing desk, and many other photographs and memorabilia. 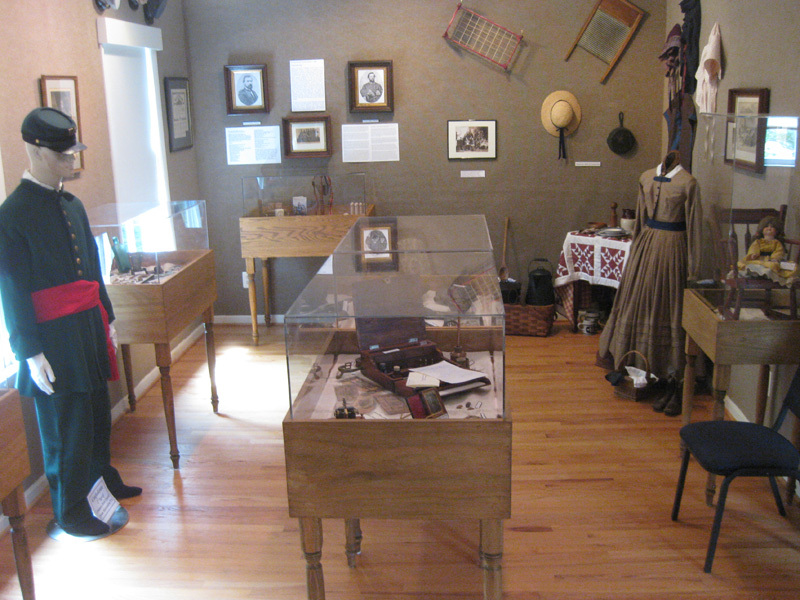 It is most fitting that this exhibit be shown at the Freeman House, as it was occupied by troops during the war. As we continue to remember the 150th anniversary of the Civil War, it is crucial for all of us to understand what happened in our area and in our nation during this time. Please visit and enjoy this free exhibit before it closes! Color brochures have been provided by Visit Fairfax and The Fairfax County Sesquicentennial Committee and are available at our exhibit. This brochure highlights all of the major events that happened in our county during the war.